Deirdre’s class had an opportunity recently to engage with two specialists in a workshop on Coding and Robotics. On Tuesday the 16th of October, two men named Ali and Stew (Yes, he is called Stew), came to our school. They taught us about robotics. They both work at a place called FABLAB in Manorhamilton. Stew showed us some robots called Ed (Yes, all of the robots are called Ed). Stew also showed us this coding website called Project Edison. We learned how to programme the robots. By typing instructions onto the website and by connecting the robot to the laptop, we were able to give instructions to the robot. We had to work together with the others in our group to instruct Ed to go through a kind of maze. It was great fun. Sometimes we had to change the instructions because Ed didn’t go exactly where we wanted him to go. Korbyn had one of the Eds do a little dance! I loved every minute of the workshop. 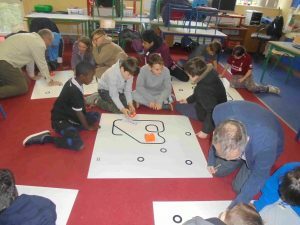 We did robotics with Ali and Stu on the 16th of October. First every group got an Edison (Name of the robots) and a barcode sheet. We had to move the robot across the barcode to see what instructions were on the barcode. Owen, Francie and I discovered that when we clapped, our robot moved towards the clapping sound. We talked about how it worked. Ali explained that our robot had sound sensors inside it and that’s why it followed our claps. The group next to us had a robot with a light sensor inside so it followed a torch when they shone it. After break, we had to programme our Ed to go from the starting point on a grid to save Steve from zombies and skeletons. Basically, we had to guide the robot to where Steve was, making sure we went around the zombies. We used a ruler to measure how far we wanted Ed to move and then we entered the instructions into the coding website. Sometimes we would say forward 5cm or turn right and forward 8cm and so on. We had to tell the robot to turn so many degrees right or left, for example, turn right 45 degrees. This way Ed knew what angle to turn before he moved forward again. In the end, we got the instructions right and Ed went around the zombies and ended up at Steve. Next, Stu showed us a drawing robot. He attached a pencil to the robot and typed instructions into the website. When he connected the robot to the laptop, and put it back on a page, the robot moved and drew a shape. First it drew a square and then it drew a triangle. Even Stu had to change some of the instructions when it didn’t do exactly what he wanted it to do. I had great fun learning about robotics. 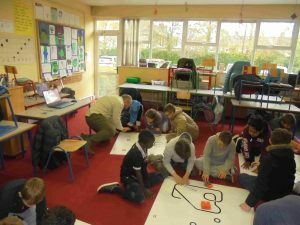 On Tuesday the 16th of October, Ali and Stu from Fablab (a science company) came to our school to do robotics/coding with us. They put four mats on the floor and divided us into groups, one group at each mat. Each group got a robot. They were called Edison after the creator of the robots. He is from Australia. First, we had to move our robot over a barcode and try to discover what Edison had been programmed to do. Ali and Stu already programmed them before they gave them to us. Our robot followed a light, another followed black lines etc. Ali and Stu showed us how to put instructions into a coding website and then we connected our robot to the laptop to programme it. Next we put Edison on the mat and when we pressed a button, the robot followed our instructions. We had to make the robot travel around the mat to get to Steve. We managed to get Ed from the start to the finish. The workshop was very interesting and I enjoyed it a lot. 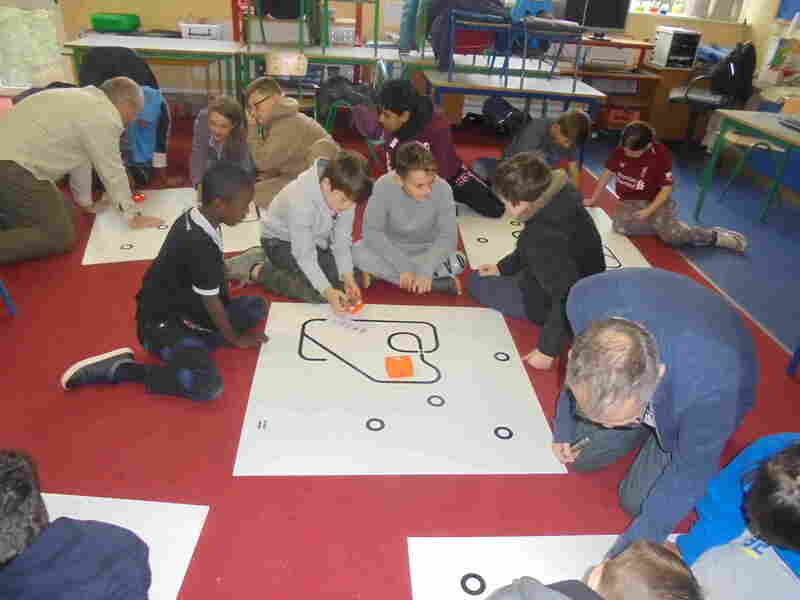 On Tuesday the 16th of October, we did robotics with Ali and Stu. The teachers separated us into groups of four. Then Stu introduced a robot called Ed. We had to figure out what our robot did. We had to clap to make it move so our robot followed sound. Afterwards, we got to programme Ed ourselves. We programmed Ed to compete the course on the floor mat. It was really great fun.